Whisk orange juice, lemon juice, oil, honey, and mustard in small bowl until smooth and well blended. Stir in mint. Brush cut sides of fruits with orange juice mixture. Set remaining dressing aside. 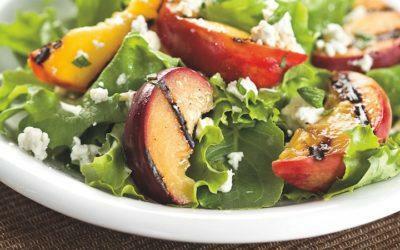 Place fruits, cut sides down, on prepared grill. Grill, covered, 2 to 3 minutes. Turn over; grill 2 to 3 minutes or until fruits begin to soften. Remove to plate; let stand to cool slightly. When cool enough to handle, cut into wedges. Arrange mixed greens on 4 serving plates. Top evenly with fruits and goat cheese. Drizzle with remaining dressing. Serve immediately. Exchanges per serving: 1/2 Fat, 1 Fruit, 1/2 Meat.